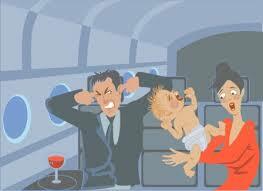 Having just returned from a hellish flight with my 1 year old and 4 year old, I thought to myself, why did I do that? And then a few months later, I will forget and do it all over again as if that experience weren’t bad enough to scar me for life (There must be a hormone that is released, like during pregnancy, that makes you forget the pain you must go through to travel with kids). Now, this isn’t about a 1 hour or 2 hour flight I am talking about, I am talking about a 7 to 12 hour+ transatlantic/transcontinental flight with a topping of jet lag, which pushes me over the edge. I am now quite an expert in airports, doing some juggling at the Xray machine, immediately locating soft plays/kids areas at airports, and my eldest loves flying because she knows she will get uninterrupted hours of Mickey Mouse/Charlie & Lola/Peppa Pig. But it is my little one who is trouble. After the 2nd hour of plane travel and trying to entertain her in a very small contained area, I think to myself, when is this torture ever going to end?? Every 5 minutes feels like an hour. And her attention span is like a hamster on speed in its hamster wheel. 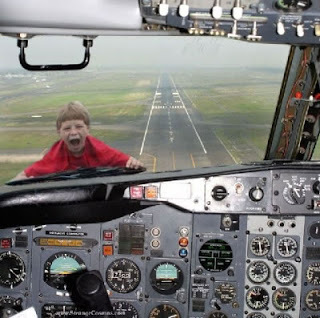 Older children are easier to manage now that we have the Power of Apple: IPads, IPhones, ITouch, and now that you can leave them on during take-off and landing, it keeps them entertained the moment they sit to landing time. Once children reach the age of being entertained by electronics, you can finally sigh and start traveling ‘en toute tranquilite.’ Babies are just trickier, especially between 12 months to 2.5 years when they have learned to walk but are not focussed enough to watch a TV show. Their brains are on speed, creating 2 million synapses per second. That is a lot of synapses. This is the height of their learning ability as humans, this is the time which determines whether they will become Einstein or not, so there is no way they are going to sit quietly while you read the FT/Vogue/Grazia or BA High Life. For every half an hour they behave, give them a reward. Food is always a winner, otherwise be prepared in advance and use old toys that they have forgotten about and wrap them up as a present to be given every half hour. That will keep them busy for 5 minutes. Children’s magazines you can buy at the airport with toys attached are also a cheap and cheerful option. 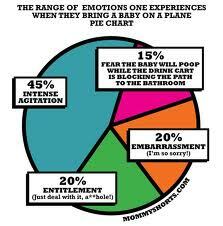 A friend of mine once said she kept her children happy through a LA-London flight by just feeding them constantly. Obviously, try to choose low fat/healthy snacks. If you becomes slightly desperate, try using one lollipop at the end of the flight as a reward. If all else fails, use whatever you have at hand. They may end up being obese and hating you for it, but at that precise moment, it doesn’t really matter. As I mentioned above, the amount of Apps/Videos you can get these days is unimaginable. Download at least 1 app for every 15 minute of the flight. For the little ones, the Bubbles App is great for hand-eye coordination and can keep them entertained for another 5 minutes. I don’t care what you do in your own home, electronic babysitters are the best friend you can have on a plane, especially if your child isn’t usually allowed gadgets at home, they will want to fly just for that reason. Not for you or the baby, but to give to all the passengers around you who start giving you dirty looks. If they can’t take a joke, make sure your baby screams right in their ear. (We once sat next to a lady in Business who complained for half an hour even before we took off about being next to our 2 year old toddler, even though our toddler is a seasoned, traveling poster child ie. she knows where to stash her toys in the drawer by her feet, plug in the earphones and scroll through the menu to the kids shows using the touch screen menu. Soon she will recite the entire steward monologue to keep your seatbelt fastened when the seatbelt light is on. We should have slipped some sleeping pills in that lady’s champagne when she wasn’t looking). 5. A Sedative or equivalent. Valium or Ambien will do just fine for your baby. Just kidding. That’s just for the parents and for the above, grumpy, unfriendly passengers next to you. Benadryl night time for babies if you are teetering on the brink. Small babies love wipes. Teach them how to clean their armrest/folding tray/window with the wipes. You don’t want to know how dirty those airplane seats are and it’s never too early to start teaching them hygiene. Bribe the airplane stewardess with Cash/Alcohol/Drugs for a five minute breather if you are traveling alone. Bribe the old granny next to you for 5 minutes babysitting in exchange for that Duty Free bottle of whiskey. Bribe anyone that is willing to help. It is a peppermint oil concoction which is apparently used to calm babies with colic. Give them a palm/sole/tummy massage to try to soothe them to sleep with it. Even if this Chinese medicine mumbo jumbo doesn’t work or isn’t your thing, that’s another 15 minutes well spent and the passengers around you will reward you for your efforts. And it is good to cover up vomit/poop/fart smells quite well. As you watch the clock every 15 minutes, visualise where you are going. If you are lucky enough to be going somewhere warm, sunny and happy, this will lower your blood pressure, calm you down, and make you smile. If you are visiting your family/in-laws that you can’t stand, don’t use this trick. It is just a period of time that will pass. No one died (or hopefully they didn’t). Just like those terrible nights when your baby just won’t sleep or the witching hour, it is just a matter of survival. And as any parent of small children knows, this is our mantra: ‘This too shall pass’. Scissors does the trick for me. I bring three with different cutting patterns. Does the trick for a little longer. Downside, no in flight magazines left after..